The student analyses the constructive solutions from the roller in spare parts and 3D computer aided files. With the roller in situation and the set of weights, he can verifies the regulation of the speed. Activities in mechanics and in resistance of the materials are also proposed with the use of calculation and simulation software. To verify the performance of an industrial product experimentally. To do an energy balance. To do a functional analysis. To carry out mechanical kinematics and dynamics modelling. To study the contact conditions between roller and pallet. To validate the model by experimentation on the real. To quantify the influence of the external parameters. To search for other technological solutions. To analyse the constructive solutions from a 3D representation and a real product. 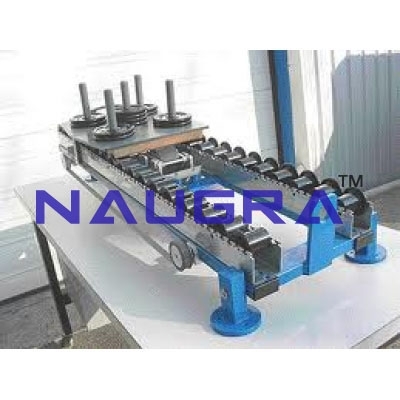 To identify the mechanical linkages and to verify the regulation of the speed. To study the relation product-process-material. The bench is composed of a section of storage channel, (1300 mm of length) constituted of two rails, and equipped with a roller brake. The slant of the channel is adjustable from 0° to 6° by step of 1°. A pallet that can be charged by masses (until 50 Kg) moves in this storage channel. A rotational speed sensor of the roller drum. A translation speed sensor of the pallet. A special design sensor with strain gauges allowing to measure the normal and tangent strength on the pallet and roller contact. These measures allow analysis of the dynamics contact phenomena between roller and pallet. Bench with 2 different rollers (one with balance weight in aluminium and the second in nylon). An acquisition card with dedicated software to plot the acquisitions in real time. Strength sensor to measure the normal and tangent strength. Simulation of the roller on SDS software. Technical manual on CD ROM. Information pack with 2 brake rollers, one complete and one dissembled. 1500 x 550 x 500 mm. PC computer 200 MHz minimum with CD-ROM drive. A set of disk weights 50 x 1 kg.